Indeed, I just mocked up a quick bevor from the given pattern in poster board and masking tape and it looks good enough I will have to start deciding what to make the final model out of for my airship boarding party armor. Give them shot and fire lad's, Make the Welkin to ring and the Gods to tremble, They shall taste British steel before the night is out. Oooh ooh ooh! Pick me, pick me, pick me!!! Uhhmmm... copper sheet or brass plate? I can't see that image, and I can't find it on deviantart. Actually I have been thinking either steel or heavy leather with brass plate, As this is boarding armor it is really intended to deflect melee weapons and shrapnel more then be proof against bullets. Leather with brass would be easiest for me to do but would cost about 50-75 for materials (using heavy "armor weight" water buffalo leather) but I really like the idea of doing it in steel and painting it Im envisioning a uniform similar to a Napoleonic Cuirassier crossed with heavy infantry from a ww1 trench raid if that makes any sense. Perhaps you could provide a description for those of us unfamiliar with the series. You want to go hereand navigate to "Characters". Once there, check out Quint or Rook. I think Rook's armour is more in keeping with Steamy goodness. Pity I can't find the Sky Pirate outfit artwork online - it features a leather breastplate with pockets for stuff like brass telescopes and the like, and a pair of expanding batwings should one fall off one's sky galleon. Cut out the leather for the bevor, with any luck Ill have the leather portion done in a few days and I can put up a pic or two. Awesome. I really like the bevor idea. I want to try it myself one day. What about boiled leather for the bevor, with brass or bronze embellishments? Personally, I'd rather have steel for weapons and armor. Brass is awfully soft. Probably leave the l;leather as is its very heavy water buffalo, planning on putting large brass plates on it in a sort of inside out coat of plates type of deal, it's primary purpose is as a spall shield (kind of like a flak jacket it would stop slow shrapnel but it wont stop a bullet). I did think about using large steel plates instead of the brass and then using fancy brass sheet designed for floor registers over it as a decoration but I don't want it to look too fancy so I'm not sure exactly what I'm doing for the metal at the moment. First, the gorget (throat armor) was worn more as military apparel than actual armor until quite late in history, and I believe it lasted into the Victorian period and even later. Second, fencers wore simple protective gear for practice and competition during the victorian era and later (even today, but it's all modern-stuff of course) so you might look into Victorian/Edwardian fencer's codpieces and gorgets. The Mensur fencers in Germany word iron goggles made specifically to protect the eyes from saber cuts as well as funny big padded collars. 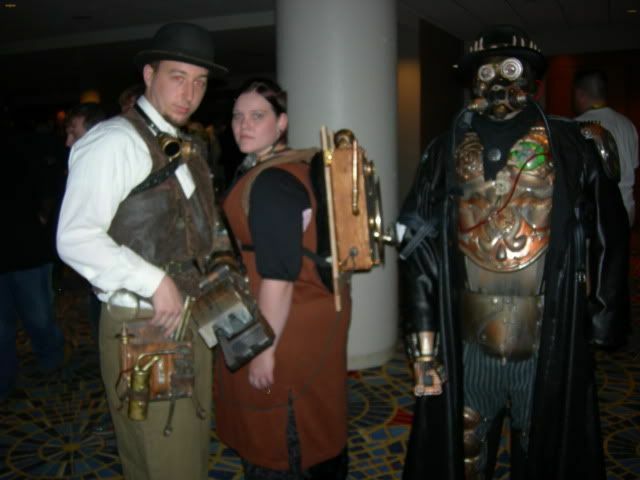 So if you're a stickler for period-accuracy in your Steampunk gear, check out some of that stuff. The armor of the bad guys in League of Ext. Gentlemen has already been mentioned, but Capt. Nemo also has little bits of armor integrated into his clothing, e.g. pauldrons (shoulder armor). Some of the original character sketches for the armored bears in Golden Compass are all brass and gears, and could be used for inspiration. The mail impermeable in Wild Wild West has already been mentioned. Hellboy II has those crazy Steampunk mecha-soldiers of the Golden Army. The rather new Steampunk book 'Boneshaker' has a character who wears an leather-and-steel armored jacket and helm/gasmask to protect from Steampunk zombie attack (yeah, that's right). So yeah, there's lots of inspiration out there already to expound upon, and Steampunk armor integrated into outfit is a fantastic idea, so a tip the armored hat to ya! If you need me, I'll be in the lab. This is the armor I made for my Airship Pirate. It'[s based on allot of different styles all bashed into one. 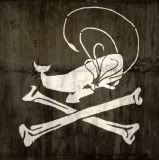 Being pirates we are scavengers. "If I get kicked out of con for shooting a NERF gun I'm stabbing someone with a toaster!" As the esteemed Victorian surgeon George Henry Makins discovered while attending to the wounded during the Anglo-Boer War in South Africa, the best defense a man could hope for in the face of the then-modern firearm (such as the Martini-Henry, Lee-Enfield, or even the Mausers of the time) was a layer of subcutaneous fat. I'm being quite serious here. If you were even mildly overweight, as a large number of the members of the British army were at the time, you were much more likely to survive being a shot. The rifles and bullets at the end of the Victorian era were designed differently than what we're used to today. It was thought that the higher the velocity of the projectile was cranked up, and the more spin from the rifling it had, the more damage would be done to the body. In all actuality, barring a strike to a bone or a vital organ, the bullet left a clean, extremely narrow path through the body. And here's the interesting thing: if there was extra fat in the area, it was pulled into the wound by the bullet, sealing it, preventing real blood loss, and keeping it somewhat clean from infection. Indeed, you had to be more worried about what you ate or drank than you did about getting shot! While it isn't really battle armour, people did still use chainmail (sorry for using that term, history buffs). Butchers and wood workers would use gloves of the stuff. I have a commercially made glove for it when I am using carving tools. Works a dream. It is nigh-impossible for me to cut my hand with it on and is just about the best cut protection you can get. They also had face masks or veils of chain that would hang down and protect their face (also seen as late as WW1 tank crews, I believe). There are a few of these ideas you could run with to make up armour ideas that are inspired by what was around at the time. 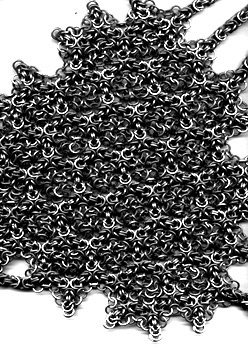 So you can work chainmail in "legitimately" or justify it if you like. You could go the Ned Kelly route and make it out of all sorts of junk and make it obviously scavenged. I believe the prohibition era gangsters attempted to make their own armour to stop the small police revolver rounds (the police got better guns to counter it IIRC and that was that), again something very much home made that could also be made and justified in a Victorian sense, I feel. If you root around you could probably do the same with a lot of ideas. It is fantasy, so you don't have to stick too rigidly to history. I myself have never been much for historically accurate. I tend to just pick things based on how they look rather then if they function or if they were used during that time. I like the idea of multi-part armor that covers the torso much like that from The League of Extraordinary Gentleman. Stand and deliver sir. Oooo, suits you sir. 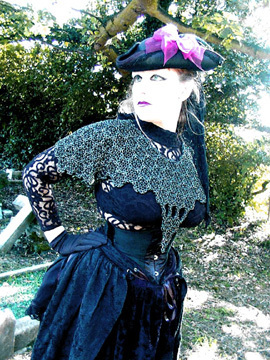 Do you have a close up or larger image of the lace? It looks like it would be very impressive in person. 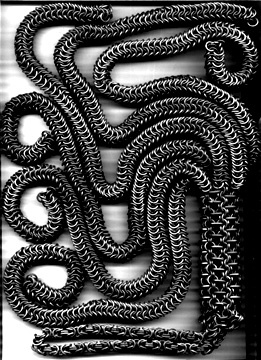 A box chain variant turned in on itself then infilled. Best made out of square cross section, 6mm. Any less and your clearances go around the 3 link spurs. Disclaimer; this is an artistic piece designed for wall hanging and should not be used for taking the legs off pine chairs or the faces off bounders. It really is fascinating stuff to look at, all the intricate repeating patterns. 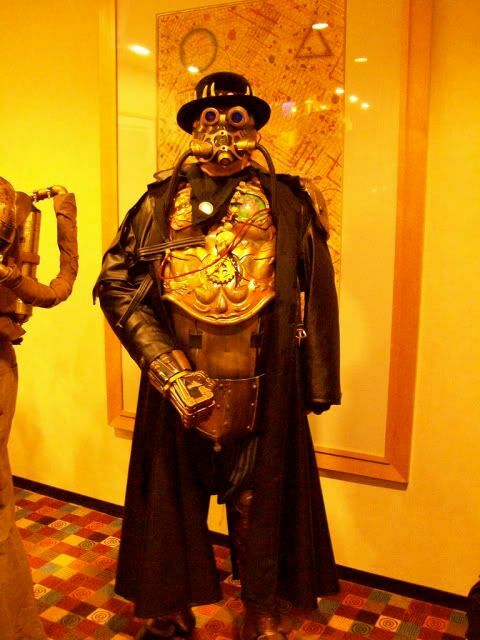 On the rather necromancered topic of Steampunk armour I'd say leather "armour" or padded cloth would probably help lessen any blows from blunt objects, bodyparts or improvised weapons while retaining hopefully enough mobility to dive for cover if shooting starts. I doubt much in the way of full armour is going to protect from the majority of steampunk weapons, the firearm side of them at least, until of course you step up another level into steampowered armour suits. 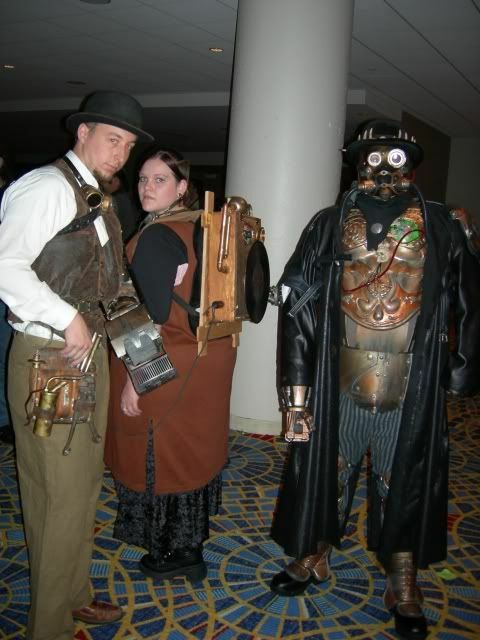 as we should know, some steampunk individuals fancy fashion over function. I actually do believe that one of the members of outland armours had a rather interesting looking brass breastplate? I think bits of armor mixed into a wardrobe would look super interesting, like a brassy clawed gauntlet or gaiters or spauldrons. maybe even brass armor-like epaulletes? Here's a pretty nifty resource for ideas for helmets and body armor right here. It's about armor in WWI, so not quite in the era, but close enough, as most steampunk is. from some of these ideas I could see somebody putting together an italian body armor from the link above this, with the collar of a diving helmet. some shoulder armor and then bracers and gauntlets. all in steel with brass inlay artwork. almost any style helmet could go with such a suit. actually for some time I've been trying to hunt down an image from a AD&D 2nd ed. book on armor. It was a tinker gnome in a suit that was pockets galore fillted with metal tools and items. Enough layers of leather pokets with metal in them that it was sort of like the ring mail or examples already given of coats of plates. Give some time and I might be able to find that image for you, rovingjack. Holy monumental effort! Found this one on the armour archive, quite impressive by armor standards or by steamy ones.